Dr. Pari Limbachia, is a graduate of the University of Florida and Parker College of Chiropractic. She previously taught as an Assistant Professor at Palmer College of Chiropractic, Port Orange and is dedicated to increasing the awareness of holistic health solutions. She has studied a variety of chiropractic techniques including: Diversified, Gonstead, Flexion-Distraction, Thompson Drop, Upper Cervical, Activator, Chiropractic Biophysics, Sacro-Occipital Technique, Applied Kinesiology, Charrette's Extremity and many more chiropactic techniques. She has also received certification in Acupuncture and studied kinesiotaping. 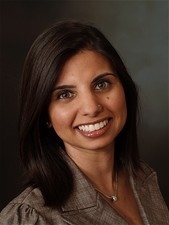 Dr. Limbachia stays current with the newest techniques and protocols through continuing education as well as her exposure to a number of chiropractic, acupuncture and wellness seminars. After working with two prominent chiropractic practices in Central Florida, Dr. Limbachia has opened her own wellness studio to help her comminity achieve optimal health.